The full moon of September hit its peak Monday (Sept. 12), thrilling skywatchers around the world who turned out to photograph the Harvest Moon of 2011. Historically, the Harvest Moon has been a boon for farmers because the moon hangs low on the southeastern horizon and shines bright enough to squeeze in a bit of extra time harvesting crops at night. That fact was not lost on skywatcher and photographer Jeffrey Berkes outside of Philadelphia, Pa., when he ventured outside with a camera in hand. 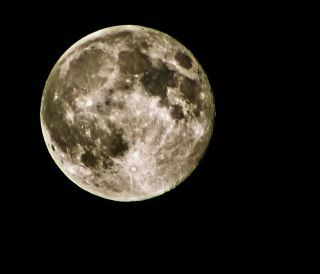 From skywatcher and photographer Jeff Berkes in the Philadelphia suburbs comes this shot of a true Harvest Moon taken on September 12, 2011. The Harvest Moon is the name given to the full moon that occurs closest to the fall (or autumnal) equinox, a time when the length of Earth's day and night are equal. This year's fall equinox occurs on Sept. 23, so the Harvest Moon peaked yesterday morning. While the moon normally rises about 50 minutes later each night, during a Harvest Moon it tends to rise about 30 minutes later across the United States. In Canada and Europe, the Harvest Moon may rise just 10 to 20 minutes later each day immediately before and after the actual full moon. SPACE.com asked readers and skywatchers to submit your photos of the Harvest Moon this year, and the results are amazing. Bev Jaeger caught the Harvest Moon on a very clear night in Alberta, Canada, September 11, 2011. In Canada, Bev Jaeger and her family took full advantage of the Harvest Moon throughout the weekend while harvesting crops on their farm near Manning in northern Alberta. Jaeger said she did not know September's full moon was the Harvest Moon until reading a SPACE.com story. "So I started to watch it about 8:30 and did notice how low to the east it was, the sky was very clear," Jaeger told SPACE.com in an email, adding that she snapped her photos on Sunday night (Sept. 11). "My husband was out combining wheat so I was waiting on the deck for the truck to come home. It was a cool evening and thought it could freeze." Skywatcher Carole Francis of Pennsylvania got a bit closer than some to the Harvest Moon over the weekend. She was flying over the northern region of the state and looking down on the effects of Tropical Storm Lee. "I was flying in a private plane with my brother earlier in the day to look at flood damage and was overwhelmed by the destruction. That night the skies had cleared of rain clouds and the most beautiful moon rose over the area," Francis told SPACE.com in an email. "I had to take these pictures to remind me that the world still turns no matter what happens to us. It's the best picture of the moon I've ever taken." Chris Frazier photographed the Harvest Moon over NASA's Vehicle Assembly Building from Space View Park in Titusville, FL, on Sept. 11, 2011. Florida-based skywatcher Chris Frazier took advantage of his location by heading out to Space View Park in Titusville, Fla., where he snapped a stunning view of the full Harvest Moon over NASA's massive Vehicle Assembly Building — the cavernous 52-story building used to assemble the Saturn 5 rockets that launched the Apollo missions, as well as the space shuttles and their associated rocket boosters and external tanks. In Chicago, Jeanne Brady went moonwatching with her mother at sunset, when the moon was slated to rise. "Since it was a beautiful evening, we went to Navy Pier, where there is a good view of the Chicago Harbor Lighthouse and Lake Michigan to the east," Brady said. "Despite some haze obscuring the moon when it was low on the horizon, the moon soon became bright and beautiful over the lake." Meanwhile, skywatcher Peter Murray soaked in a stunning scene at Dana Point Harbor in Orange County, Calif., where the Harvest Moon shined over the port during a parade of tall ships. "The evening was beginning with the full moon rising through the masts of the tall ships while in the opposite direction the sun was setting on a great day out on the water," Murray told SPACE.com. "The old sailing ships are from another time and place and for a few hours we were all back there together." Even astronauts in space took a moment to savor the Harvest Moon. Astronaut Ron Garan, aboard the International Space Station, tweeted a picture of the Harvest Moon on Sept. 12, 2011: "One of our 16 moonrises yesterday #FromSpace (I'll miss these)"
"One of our 16 moonrises yesterday #FromSpace," Garan wrote in a post on Twitter, where he's been chronicling his mission for the public. "(I'll miss these)," he added.